Diyabet prevalansı ve insidansı her geçen gün artmaya devam eden global bir sağlık problemidir. Diyabetik komplikasyonların sıklığı diyabet tanı ve tedavisini önemli kılmaktadır. Günümüzde, diyabet de dahil olmak üzere çok sayıda hastalığın Endoplazmik Retikülüm (ER) stres kaynaklı apoptoz ile ilişkili olduğuna inanılmaktadır. Epstein-Barr virusun proliferatif etkinliği; Epstein-Barr Nuclear Antigen-1 (EBNA1) ve Latent Membrane Protein-1 (LMP1) adlı iki mediatör protein aracılığıyla olmaktadır. Bu çalışmada; pankreatik beta hücre kayıplarının bertarafında iligili EBV proteinlerinin kullanılması amaçlanmıştır. Ayrıca ilgili proteinlerin ER stresi, insulin sentez ve salınımı ve DNA hasarı üzerine etkilerinin araştırılması hedeflenmiştir. Bu hedefler için, 0,1 ppm ve 0,5 ppm dozlarında ticari olarak elde edilen rekombinant EBNA1 ve LMP1 proteinleri kullanılmıştır. Bu proteinlerin proliferasyondan sorumlu olduğu bilinen genlerin mRNA ekspresyon seviyeleri üzerindeki olası etkileri araştırılmıştır. Çalışmada DNA hasarı Comet Assay ile, proliferasyon düzeyleri Real Time RT-PCR ile analiz edilmiştir. RT-PCR çalışmasında, hücre proliferasyonundan sorumlu oldukları bilinen PDX 1,WNT 4, FoxO1, TCF7L2 ve beta katenin genlerinin mRNA ekpresyon düzeyleri control grubana nazaran EBNA 1 grubunda sırasıyla 6.48, 4.25, 2.37, 3.8 ve 1.4 kat arttığı tespit edilmiştir. Aynı zamanda ilgili proteinlerin ER stres kaynaklı genlerin ekspresyon seviyelerini bastırarak beta hücre kayıplarını tersine çevirmek açısından avantajlı olabileceği gösterilmiştir. Bu proteinlerin antidiyabetik tedavilerde viro-terapötik ajan olarak kullanılması bu konuda daha üst düzey çalışmalarla desteklenmeye muhtaçtır. The prevalence and incidence of diabetes is a global healthcare-management problem that is increasing almost every day. The high numbers of complications make the diagnosis and treatment of diabetes extremely important. Nowadays, it is believed that a large number of diseases, including diabetes, are related to the Endoplasmic Reticulum (ER) stress-induced apoptosis. Proliferative activity of Epstein-Barr Virus (EBV) proteins occurs via two mediators Epstein-Barr Nuclear Antigen-1 (EBNA1) and Latent Membrane Protein-1 (LMP1). In this study, it was aimed to investigate the reversal of pancreatic cell loss by applying recombinant viral EBV proteins. It has also been investigated how related proteins can effect DNA damage, ER stress, and contribute to insulin synthesis-release. For these targets, it has been decided to use doses of 0.1 ppm and 0.5 ppm of commercially obtained recombinant EBNA1 and LMP1 proteins. The possible effects of these proteins on mRNA expression levels of genes known to be responsible for the specified proliferation have been investigated. In the study, DNA damage was analyzed by Comet Assay, and Endoplasmic Reticulum stress was analyzed by Real Time RT-PCR. In RT-PCR studies, mRNA expression levels of cell proliferation markers including PDX 1, WNT 4, FoxO1, TCF7L2 and beta catenin genes in the EBNA1 group were increased by 6.48, 4.25, 2.37, 3.8 and 1.4 times, respectively compared with control group. At the end of the study; EBV recombinant proteins LMP1 and EBNA1 have been shown to increase the expression levels of genes responsible for proliferation. It has also been shown that related proteins may be advantageous in reversing beta cell losses by suppressing the expression levels of ER stress-inducing genes. It has been thought that the use of viro-therapeutic agents in antidiabetic treatments may be appropriate if supported by higher-level studies in this regard. 2. International Diabetes Federation. Diabetes Atlas. 4th Edition, Brussels, Belgium, 2009. 4. EUROBIAB-ACE Study Group. Varition and trends in incidence of cihildhood Diabetes in Europe. Lancet vol. 355, pp. 873-876, 2000. 6. Bonnet M., Guinebretiere J.M., Kremmer E., Grunewald V., Benhamou E. and Contesso G. Detection of Epstein-Barr virus in invasive breast cancer. Journal of the National Cancer Institute vol. 91(16) pp 1376–1381, 1999. 7. Kutok J.L. and Wang F. Spectrum of Epstein-Barr Virus-Associated Diseases. Annual Review of Pathology. vol. 1, pp. 375–404, 2006. 8. Nonkwelo C., Skinner J., Bell A., Rickinson A. and Sample J. Transcription start sites downstream of the Epstein-Barr virus (EBV) Fp promoter in early-passage Burkitt lymphoma cells defi ne a fourth promoter for expression of the EBV EBNA-1 protein. Journal of Virology vol 70, pp. 623–627, 1996. 9. Doğan B. Tekrarlayan tonsillit hastalarının tonsil dokularında EBV’nin gerçek zamanlı polimeraz zincirleme reaksiyonu ile kantitatif tespiti ve serum VCA-IgG titreleri ile korelasyonu. Thesis. Gazi University Instutiın of Health Sciences, Ankara, Turkey, 2005. 10. Yaung L.S. and Murray P.G. EBV and oncogenesis: from latent genes to tumours. Oncogene vol. 22, pp. 5108–5121, 2003. 11. Izumi K.M. and Kieff E.D. The Epstein-Barr virus oncogene product latent membrane protein 1 engagesthe tumor necrosis factor receptor associated death domain protein to mediate B lymphocyte growth transformation and activate NF-kappa B. Proceedings of the National Academy of Sciences of the United States vol, 94 pp. 12592–12597, 1997. 12. Zheng H., Li L., Hu D., Deng X. and Cao Y. Role of Epstein-Barr Virus encoded Latent Membrane Protein 1 in the carcinogenesis of nasopharyngeal carcinoma. Cellular &Molecular Immunology, vol. 4(3) pp. 185–196, 2007. 13. Nicholas J.K. The Bradford Method For Protein Quantitation The Protein Protocols Handbook. Totowa, NJ: Humana Press Inc. 2009. 14. Gou Y., Sun C., Hu L., He J., Zhang C., Feng Y., Zhang P., Kong X., Xiao L. and Li Y. Correlation between DNA damage and EB virus infection in nasopharyngeal carcinoma. Xi Bao Yu Fen Zi Mian Yi Xue Za Zhi. Vol 30(2) pp. 184–187, 2014. 15. Ju Y., Xu T., Zhang H. and Yu A. FOXO1-dependent DNA damage repair is regulated by JNK in lung cancer cells. International Journal of Oncology. Vol. 44(4) pp. 1284–1292, 2014. 16. Hayakawa J., Depatia C., Ohmichi M. and Mercola D. The Activation of c-Jun NH2-terminal Kinase (JNK) by DNA-damaging Agents Serves to Promote Drug Resistance via Activating Transcription Factor 2 (ATF2) – dependent Enhanced DNA Repair. Journal of Biological Chemistry. Vol. 278, pp. 20582–205892, 2003. 17. Tobiume K., Matsuzawa A., Takahashi T., Nishitoh H., Morita K., Takeda K., Minowa O., Miyazono K., Noda T. and Ichijo H.. ASK1 is required for sustained activations of JNK/p38 MAP kinases and apoptosis. EMBO Reports. vol 2(3) pp. 222–228, 2001. 18. Laherty C., Hu H., Opipari A., Wang F. and Dixit V.. The Epstein- Barr virus LMP1 gene product induces A20 zinc fi nger protein expression by activating nuclear factor, KB. Journal of Biological Chemistry. Vol. 267, pp. 24157–24160, 1992. 19. Rowe M., Peng-Pillon M., Huen D., Hardy R., Croom-Carter D., Lundgren E., Rickinson A.B. Up regulation of bcl-2 by the Epstein- Barr virus latent membrane protein LMP1: a B-cell specifi c response that is delayed relative to NF-KB Activation and to induction to cell surface markers. Journal of Virology, vol. 68 pp. 5602–5612, 1994. 20. Tran T. M., Temkin V., Shi B., Pagliari L., Daniel S., Ferra C. and Pope R.M. TNF�-induced macrophage death via caspase-dependent and independent pathways. Apoptosis, vol. 14(3) pp. 320–322, 2009. 21. De Leo A., Arena G., Stecca C., Raciti M. and Mattia E. Resveratrol inhibits proliferation and survival of Epstein Barr virus-infected Burkitt’s lymphoma cells depending on viral latency program. Molecular Cancer Research, vol. 9(10), pp. 1346–1355, 2011. 22. Meier I., Shephard S. E. and Lutz W. K. Nitrosation of aspartic acid, aspartame, and glycine ethyl ester. Alkylation of 4-(p-nitrobenzyl)pyridine (NBP) in vitro and binding to DNA in therat. Mutation Research, vol. 238(3), pp. 193–201, 1990. 23. Rudin M., Ben-Abraham R., Gazi V., Tendler V., Tashlykov V. and Katz Y. Single-dose ketamine administration induces apoptosis in neonatal mouse brain. Journal of Basic Clinical Physiology and Pharmacology, vol. 16(4) pp. 231–243, 2005. ISNAD Şen, Serkan , Şen, Merve , Altındiş, Mustafa , Çelik, Sefa , Altunbaş, Korhan , Ciğerci, İbrahim Hakkı . "Potential Contribution to Antidiabetic Treatments of Epstein-Barr Virus Proteins LMP1 and EBNA1". 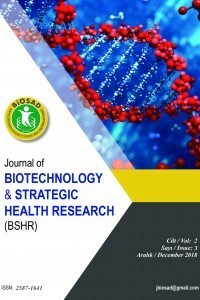 JOURNAL OF BIOTECHNOLOGY AND STRATEGIC HEALTH RESEARCH 2 / 3 (December 2018): 146-155.